The Central Catskills Chamber of Commerce, located on Main Street in Margaretville is a convenient location for visitors to learn about where they are and what there is to do. We provide printed material describing trails for hiking, kayaking and canoeing rentals and reservoir access details for using the pristine bodies of water for specific recreational activities. The country roads are perfect for cycling and area ski centers off great summertime fun for mountain biking with challenging trails and organized races and adventures for the skier whether expert or beginner. The Central Catskills is well known for offering a spectacular destination wedding with unique settings, renovated barns and the most spectacular scenery for your special day. Lodging options range from private homes for family and group gatherings to quaint village suites. Luxury resort style lodging with onsite restaurants to cozy B&B's where freshly laid eggs are favorite breakfast faire. Visit the Central Catskills from Kingston, NY along Route 28 to Andes to enjoy what the newly established Catskill Mountains Scenic Byway, one of NYS most scenic roadways. 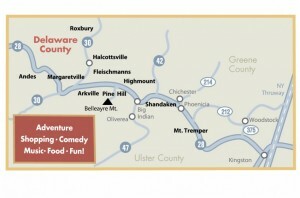 Download a new audio tour about our Route 28 at www.Drive28.com to get a feel for our hometowns. 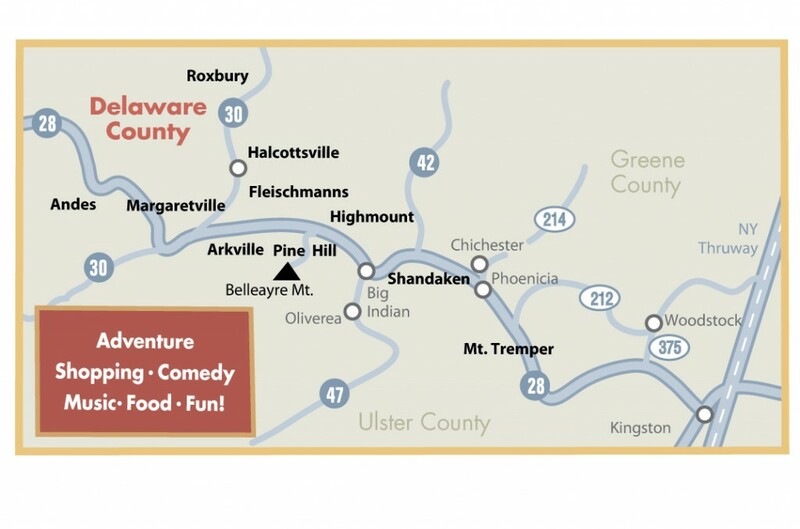 • Connecting 6 Route 28 communities in the Central Catskills of NYS: Towns of Olive, Shandaken, Middletown including the Villages of Fleischmanns and Margaretville and Town of Andes. • The Ashokan and Pepacton Reservoirs frame the Catskill Mountains Scenic Byway. These are two of the largest reservoirs in the NYC/Catskill Watershed region. Ashokan reservoir offers permited fishing in non-motorized boats and Pepacton offers permitted fishing as well and has added non-motorized boating as well. Access Permits, free, are necessary and are available online at www.nyc.gov/dep/accesspermit. Celebrate the history of cauliflower growing in the Margaretville area. 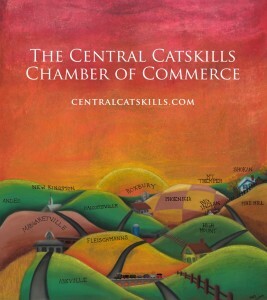 Tractor Parade, farming demos, pony rides, farm animals, music, great food and Pure Catskills food produces. Cauliflower for Sale. Fall Foliage at its best. Shopping, music, ski lift rides and good. Celebrate the fall colors of the Catskill Park and get ready for winter skiing. • Shandaken Day, August - Celebrate the communities of the Town of Shandaken with old-fashioned games, Hamlet Heroes, music and shopping.